The change in ocular dominance (OD) after monocular deprivation (MD) is one of the most prominent models of experience-dependent plasticity in the neocortex. Whereas MD is known to evoke an OD shift in the binocular part of primary visual cortex (V1)1–4, robust OD changes in the dorsolateral geniculate nucleus (dLGN) of the thalamus have not been reported so far2,5. This and similar findings led to the prevailing view that after an early developmental phase of subcortical activity-dependent changes6, plasticity in the visual system is exclusively cortical in the mature brain7,8. However, none of the recordings in dLGN to date have been performed chronically with single-cell resolution. Hence, changes in the eye-specific responsiveness of individual thalamic relay cells (TRCs) could have easily been missed. Furthermore, in contrast to the classical view of strict eye-specific segregation in dLGN9–11, some recent studies have reported that a substantial fraction of rodent TRCs is binocular12,13, which could provide a substrate for competitive TRC plasticity. This led us to re-address the questions of thalamic binocularity and experience-dependent OD plasticity, using chronic two-photon Ca2+ imaging of TRCs projecting to binocular V1. We conditionally expressed the genetically encoded Ca2+ indicator GCaMP6m14 in the dLGN of Scnn1a-Tg3-Cre mice15 using adeno-associated virus16–19 and followed the visually evoked Ca2+ signals of individual TRC axonal boutons in layer 1 (L1) of binocular V1 for up to 4 weeks before and after MD (Fig. 1a-d). Our chronic bouton recordings provided a reliable and minimally-invasive longitudinal readout for the activity of TRCs in dLGN, specifically (see Methods and Supplementary Fig. 1,2). a) Schematic of imaging approach. b) Experimental timeline and two example image volumes illustrating facilitated refinding of boutons over the extended time-course of the experiment (four slices at an image plane depth increment of 3 μm, scale bar 10 μm, frame-averaged GCaMP6m fluorescence; see Methods and Supplementary Fig. 1). c) Example of a color-coded response map of individual TRC boutons. Ocular dominance (OD) is depicted as the pixel-wise peak fluorescence change in response to ipsi- and contralateral eye preferred grating presentation (scale bar 10 μm). Red hues indicate ipsilateral dominance (ocular dominance index, ODI = (ΔF/Fcontra – ΔF/Fipsi) / (ΔF/Fcontra + ΔF/Fipsi); ODI < 0), and blue hues indicate contralateral dominance (ODI > 0). d) Ca2+ signals in a binocular (top) and two monocular example boutons in response to ipsi- and contralateral eye drifting grating stimulation (scale bars: ΔF/Fo = 200 %, 10 s). e) Fraction of responsive dLGN boutons and excitatory L2/3 cell bodies in binocular V14 showing purely ipsilateral, purely contralateral or binocular significant responses (dLGN, n = 725 boutons, 9 mice; V1, n = 2.095 cells, 14 mice; P < 10-3, χ2 test). f, g) Violin plots of gOSI (f) and gDSI (g) of ipsi-, contralateral and binocular dLGN boutons and L2/3 cell bodies, respectively. Horizontal lines indicate medians, shaded areas the mirrored probability density estimates (dLGN, n = 725 boutons, 9 mice; V1, n = 2.095 cells, 14 mice; all gOSI dLGN vs. V1, P < 10-193, all gDSI dLGN vs. V1, P < 10-120, Mann-Whitney U-test; gOSI dLGN, P = 0.65; gDSI dLGN, P = 0.016, Kruskal-Wallis test, ipsi- or contralateral vs. binocular P = 0.11 and P = 1, Bonferroni corrected; gOSI V1, P < 10-6; gDSI V1, P = 0.066, Kruskal-Wallis test, ipsi- vs. contralateral or binocular gOSI P < 10-5 and P < 10-6, Bonferroni corrected; see Supplementary Fig. 3 for tuned TRC examples and further quantification). Here and in the following figures, *P <0.05, **P < 0.01, ***P < 0.001. Recent electrophysiological studies have reported a large fraction of binocular neurons in rodent dLGN12,13. It is, however, difficult to rule out that this could have been the result of imperfect single unit isolation. Two-photon Ca2+ imaging circumvented this problem by allowing us to measure the OD of single boutons along dLGN afferents in V1 (Fig. 1c-e). We indeed observed unambiguous responses to both eyes in a subset of boutons (Fig. 1d). However, the binocularly responsive fraction (dLGN: 14%, Fig. 1e) was considerably smaller than that reported in recent electrophysiological experiments13. When comparing the OD of dLGN afferents with that of excitatory L2/3 cells in binocular V1, we found that, as expected, cortical neurons were significantly more binocular than dLGN afferents (cortex: 42%, Fig. 1e, P < 10-3), whereas the ratio of contralateral-over ipsilateral-eye population responses was comparable (Supplementary Fig. 3e,f, P = 0.36). Therefore, mouse V1 does not simply inherit binocularity from binocular geniculate cells, but, similar to carnivorans and primates5, predominantly integrates eye-segregated dLGN input. We compared the stimulus selectivity of binocular TRCs to their monocular counterparts and to excitatory L2/3 cells in V1. We found, as expected18–21, that TRCs were far less orientation- and direction-selective than cortical neurons (Fig. 1f,g; gOSI: P < 10-193; gDSI: P < 10-120). Similar to cortex, ipsilateral TRC boutons tended to be slightly less sharply tuned than contralateral boutons (Fig. 1f,g). However, the stimulus selectivity of binocular and monocular TRC boutons did not differ in any of the parameters we tested (Fig. 1f,g; gOSI: P = 0.65; gDSI: P = 0.016, with ipsilateral and contralateral vs. binocular gDSI P = 0.11 and P = 1, respectively), arguing against the possibility that binocular dLGN cells may represent a separate visual processing channel in mice. Does the mature dLGN show experience-dependent plasticity? To test this, we subjected adult mice to 6-8 days of contralateral eye MD (see Methods). Contrary to the prevailing view, we observed a clear (Fig. 2, P < 10-8) and largely reversible (Supplementary Fig. 4) OD shift. Whereas most TRC boutons were monocular during baseline, many acquired binocularity during MD (Fig. 2c). More than half of the responsive boutons changed their ocular dominance index (ODI) significantly (>1 standard deviation of pre-MD baseline fluctuations, Fig. 2d). In fact, the fraction of plastic boutons, the population shift magnitude, and the decrease in the fraction of responsive boutons after MD (Fig. 2e) were comparable to the effects of MD in excitatory L2/3 neurons in V14 (Supplementary Fig. 5a). a) Functional map examples of TRC boutons of a single animal (sorted by pre-MD ODI) imaged over four sessions before and after contralateral-eye MD. Note the shift from blue (contralateral) to white (binocular) and red (ipsilateral) hues after MD. b) Ca2+ signals in an example bouton in response to ipsi- and contralateral eye drifting grating stimulation over selected sessions covering OD plasticity (scale bars: ΔF/Fo = 200 %, 10 s). c) Single-bouton ODI distribution during baseline (mean of three pre-MD sessions, ODI = 0.40 ± 0.63, standard deviation, SD) and after 6-8 days of MD (post-MD: ODI = 0.19 ± 0.67, SD, n = 258 boutons, 9 animals, P < 10-8, Wilcoxon signed-rank test). Lines connect individual, continuously responsive boutons; line color indicates shift significance in units of SDs over pre-MD baseline fluctuations. Colored ODI histogram bins indicate class definitions for contralateral (blue), binocular (white) and ipsilateral (red) boutons. d) Fraction of boutons showing a significant (>1 SD) MD-evoked ODI change (n = 142 out of 258 boutons). e) Fraction of responsive and unresponsive boutons before and after MD (n = 896 boutons, P = 0. 021, χ2 test). f) Bouton-wise change in eye-specific response amplitude after MD (n = 352 boutons responsive in all pre-MD sessions, color-coded for mean pre-MD ODI). The concentration of blue data points in the upper left quadrant indicates that the population OD shift towards the non-deprived eye is largely driven by initially contralateral boutons losing contralateral-eye and gaining ipsilateral-eye responsiveness. g) Quantification of (f), grouped into pre-MD ODI sextiles comprising similar numbers of boutons (58-59 boutons per class, paired t-tests; monocular ODI classes indicated by red and blue shading as defined in (c)). See Supplementary Fig. 5 for comparison with excitatory L2/3 cells in V1. On the population level, the OD shift resulted from a net increase in ipsilateral-eye and a decrease in contralateral-eye responsiveness (Supplementary Fig. 4e). 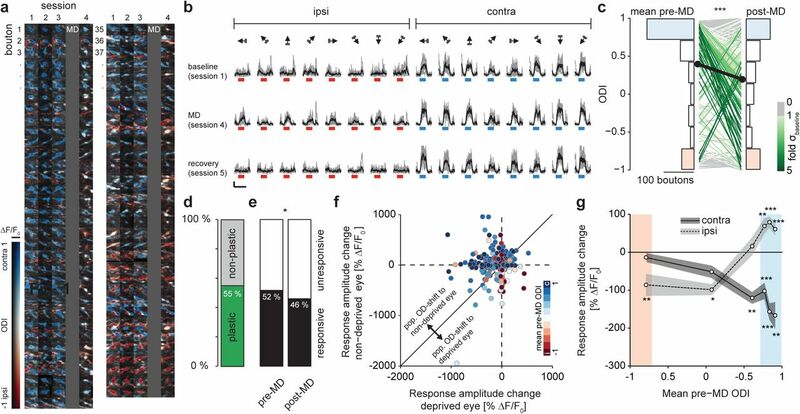 On the level of individual geniculate afferents, boutons that were exclusively responsive to the contralateral eye during baseline showed the most prominent decrease in contralateral-eye evoked activity (Fig. 2f,g). This form of deprived-eye depression is similar to our previous observation in excitatory L2/3 cells in V14 (Supplementary Fig. 5b,c). However, very different from cortex, initially monocular contralateral boutons also showed the most prominent increase in ipsilateral-eye responsiveness (compare Fig. 2f,g and Supplementary Fig. 5b,c). We found that many TRC boutons, even if they appeared monocular during baseline, received robust input from both eyes after MD (Fig. 2c). What are potential explanations for such a prominent OD change? 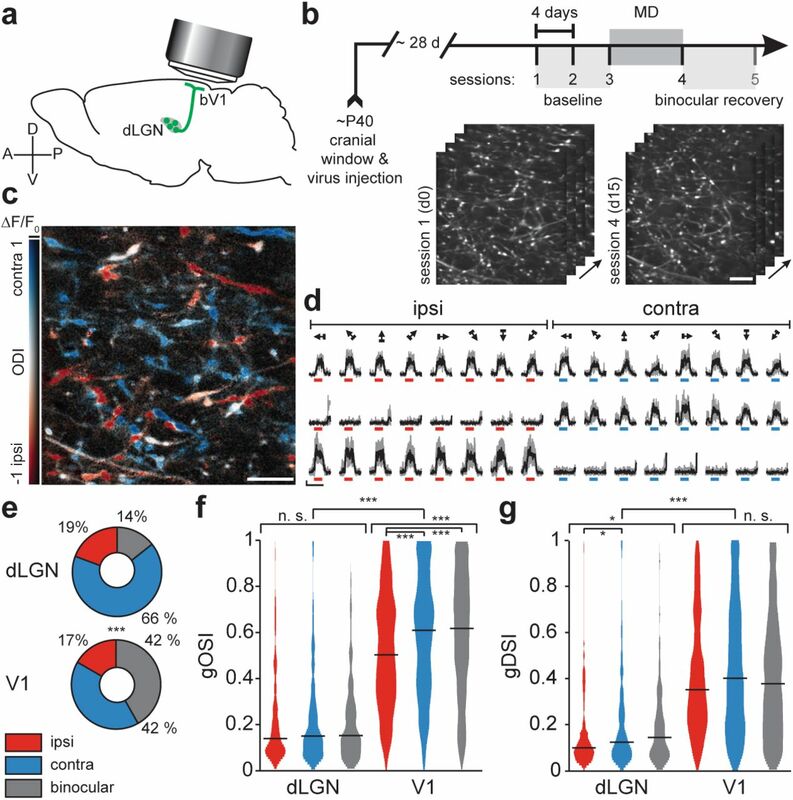 One – in our view less likely – explanation resides in the fact that the dLGN receives substantial modulatory feedback from V122 and weaker input from superior colliculus23,24. A decrease in cortical deprived-eye responsiveness4 (Supplementary Fig. 5b,c) could therefore, in principle, propagate to the dLGN and contribute to a decrease in thalamic responsiveness to the deprived eye that mirrors the cell-specific changes in L2/3 (Fig. 2f,g). We consider this less probable, however, because convergent modulatory cortical and subcortical feedback would at the same time have to elicit highly target-specific changes in non-deprived-eye responsiveness in order to lead to the specific strengthening of ipsilateral responses of initially contralaterally dominated TRCs (Fig. 2f,g). This is even more unlikely given the very different cortical changes in non-deprived-eye response strength. Here, all excitatory L2/3 cells, except initially monocular contralateral cells, increase their ipsilateral eye responsiveness after MD4 (Supplementary Fig. 5b,c). The, perhaps unexpected, but most parsimonious explanation is therefore, that the synapses of retinal ganglion cells (RGCs) onto TRCs are the site of change. Recent connectomics studies report a dramatic mismatch between a large structurally25–27 and much smaller functionally11,28 identified number of RGCs converging onto TRCs. We therefore speculate that unsilencing of structurally present but functionally silent ipsilateral RGC input27,29 may be the reason for the robust OD plasticity we observe in the dLGN. Regardless of the precise mechanism, our results clearly show that – contrary to current models – the eye-specific responses of dLGN neurons are not rigid but undergo substantial functional OD plasticity. Given the paramount importance of this paradigm for theories of experience-dependent plasticity and the ever more widespread use of mice as model organisms, we conclude that one needs to exert caution when employing purely cortical interpretations of OD plasticity. We thank C. Huber, V. Staiger, F. Voss and H. Tultschin for technical assistance, J. Sigl-Glöckner for help with our transfection protocol, and P. Goltstein for programming help. This work was supported by the Max Planck Society, a Marie Curie Intra-European Fellowship to T.R., a Boehringer Ingelheim Ph.D. fellowship to J.J., and the Deutsche Forschungsgemeinschaft (grant SFB870 to T.R. and T.B.). Data and analysis codes are stored and curated at the Max Planck Computing and Data Facility Garching, Munich, Germany. Wiesel, T.N. & Hubel, D.H. J. Neurophysiol. 26, 978–93 (1963). Dräger, U.C. J. Neurophysiol. 41, 28–42 (1978). Rose, T., Jaepel, J., Hübener, M. & Bonhoeffer, T. Science 352, 1319–22 (2016). Sherman, S.M. & Spear, P.D. Physiol. Rev. 62, 738–855 (1982). Huberman, A.D., Feller, M.B. & Chapman, B. Annu. Rev. Neurosci. 31, 479–509 (2008). Fox, K., Wallace, H. & Glazewski, S. Philos. Trans. R. Soc. Lond. B. Biol. Sci. 357, 1709–15 (2002). Gilbert, C.D. & Wiesel, T.N. Nature 356, 150–152 (1992). Grubb, M.S., Rossi, F.M., Changeux, J.P. & Thompson, I.D. Neuron 40, 1161–72 (2003). Zhao, X., Liu, M. & Cang, J. Nat. Commun. 4, 2088 (2013). Ziburkus, J. & Guido, W. J. Neurophysiol. 96, 2775–84 (2006). Grieve, K.L. J. Physiol. 566, 119–24 (2005). Howarth, M., Walmsley, L. & Brown, T.M. Curr. Biol. 24, 1241–1247 (2014). Chen, T.-W. et al. Nature 499, 295–300 (2013). Madisen, L. et al. Nat. Neurosci. 13, 133–140 (2010). Cruz-Martín, A. et al. Nature 507, 358–61 (2014). Sun, W., Tan, Z., Mensh, B.D. & Ji, N. Nat. Neurosci. 19, 308–15 (2016). Kondo, S. & Ohki, K. Nat. Neurosci. 19, 316–319 (2015). Roth, M.M. et al. Nat. Neurosci. 19, 299–307 (2016). Piscopo, D.M., El-Danaf, R.N., Huberman, A.D. & Niell, C.M. J. Neurosci. 33, 4642–56 (2013). J, W. et al. (2013). Bickford, M.E. Front. Neural Circuits 9, 86 (2016). Grubb, M.S. & Thompson, I.D. Vision Res. 44, 3365–3376 (2004). Bickford, M.E., Zhou, N., Krahe, T.E., Govindaiah, G. & Guido, W. J. Neurosci. 35, 10523–10534 (2015). Morgan, J.L., Berger, D.R., Wetzel, A.W. & Lichtman, J.W. Cell 165, 192–206 (2016). Hammer, S., Monavarfeshani, A., Lemon, T., Su, J. & Fox, M.A. Cell Rep. 12, 1575–1583 (2015). Jaubert-Miazza, L. et al. Vis. Neurosci. 22, 661–76 (2005). Moore, B.D., Kiley, C.W., Sun, C. & Usrey, W.M. Neuron 71, 812–819 (2011). Durand, S. et al. J. Neurosci. 36, 12144–12156 (2016). Hofer, S.B., Mrsic-Flogel, T.D., Bonhoeffer, T. & Hübener, M. Nat. Neurosci. 9, 127–132 (2006). Greifzu, F. et al. Proc. Natl. Acad. Sci. 111, 1150–1155 (2014). Matthies, U., Balog, J. & Lehmann, K. J. Neurosci. 33, 11774–8 (2013). Pologruto, T.A., Sabatini, B.L. & Svoboda, K. Biomed. Eng. Online 2, 13 (2003). Pelli, D.G. Spat. Vis. 10, 437–442 (1997). Brainard, D.H. Spat. Vis. 10, 433–436 (1997). Mazurek, M., Kager, M. & Van Hooser, S.D. Front. Neural Circuits 8, 92 (2014).